Sure, the shower curtain won’t be the centerpiece of your bathroom. But this also doesn’t mean that you shouldn’t put attention in buying one. After all, it has a lot of uses. And I am not just talking about giving you some privacy while you are in the shower area and if you want , can get details about shower head. The shower curtain, for one, can define the overall look of the bathroom. This is especially true if you install shower curtain with a color that blends well with the dominant hues in the bathroom. And it can also keep your bathroom floor dry.There is a lot of debate about which one is better, but it's certainly sure that best shower curtains are also more affordable option than best shower doors. There are basically three materials to choose from when shopping for a shower curtain—synthetic, natural fabric, and organic fabric. Synthetic fabric such as vinyl, polyester, and nylon has the longest life span compared to the other two materials. It can resist moisture, aside from being very easy to clean. It is also less likely to have mold and mildew. Natural fabric like satin, silk, and cotton are bereft of chemicals that are often found in synthetic fabric. It is thus a more environment-friendly and healthy option. The same goes for organic fabric or hemp, which can keep bacteria away. However, shower curtains made of organic and natural fabric are more expensive than those made of synthetic materials. The curtain liner may be made of various materials like vinyl, which is known for being water resistant. But the problem with vinyl is that there are a lot of health concerns about it. Polypropylene is a more environment friendly and safe option, but it isn’t as water resistant as PVC. Simply put, you want the shower curtain to last for a long time, and not weeks. In choosing a durable shower curtain, look at the way it was stitched. Curtains with double stitches are more durable, preventing frazzling of the curtain from its edges. You may also look at the grommets of the curtain. These are plastic or metal rings used to strengthen the holes in shower curtains. Choose a shower curtain that can be cleaned easily, like wiping it with a damp cloth. There are also shower curtains that are washing machine-friendly. This shower curtain is mold and mildew resistant. It comes in three sizes--- 54 x 72 inches, 72 x 72 inches, and 72 x 84 inches. It is also available in a wide range of colors. Many reviews .com indicate that this is an easy-to-clean shower curtain. You will only have to wipe it clean with a damp cloth. The shower curtain also does an excellent job of keeping the water in the shower, as the water glides off it. The curtain also dries very fast. The curtain liner is also soft and flexible. The magnets at the bottom have enough weight for it to stay in place. This is important as it prevents the shower curtain from sticking to you while you take a bath. However, a common complaint is that the shower curtain is too thin. This shower curtain is made from durable polyester fabric. I can say that this is designed to withstand moist environments, and repel mold and mildew.It has a nice creamy white color that allows it to blend well with almost any bathroom. And its manufacturer, LiBa, backs it up with a 90-day money back guarantee. Many Amazon.com reviewers are in awe of this shower curtain. They say that it is well-made. The stitching is secure and even, with seams that are well-sewn. They also like that the holes where the hooks are placed appear sturdy and reinforced. The color of the shower curtain is also very nice, according to reviewers .com. They say that the white color blends very well with their bathroom. They add that the shower curtain also helps in making the shower a bit brighter. But if there’s something that they don’t like, then it would have to be the plastic smell that this curtain emits. This shower curtain is made of vinyl, with a reinforced nylon mesh header. It measures 72 inches wide by 72 inches long; and should fit a standard size shower area. It is very resistant to mold and mildew, too.Most reviews .com indicate that it is a very heavy duty curtain. It is strong and thick. Those who own one say it has grommets that prevent the top from tearing. The sturdy top ensures that it would last for a long time. Other owners of this shower curtain say that it is easy to clean. They also describe it to be well-made that it should not be compared to a dollar store curtain. However, not all reviewers speak highly of this shower curtain. Other disappointed reviewers .com say that the shower curtain is a bit thin. Some also say that it has a strong plastic smell. This is a nylon shower curtain that has a tree design on it. Don’t let the color fool you. It may be colored white but it isn’t see-through. The tree design gives it an elegant look, while the nylon material is very good at resisting water. It is also very easy to clean. Surprisingly, this shower curtain gets a lot of positive feedback. Those who have installed one in their bathrooms say it isn’t thin. They also say that it does not get easily cracked, unlike the typical curtain made of vinyl. Some people also have good words for the tree design, saying it is a nice touch. In terms of durability, this shower curtain has reinforced holes so it is unlikely to fall apart that easily. But not all owners are happy with this product. Some of them complain that the tree design isn’t even centered. Others aren’t also thrilled with the tree design, saying it makes the shower curtain look like a Halloween décor. The main selling point of this shower curtain is its beautifully designed imprint with thistle plants. According to those who own it, the design can make an otherwise bland bathroom more beautiful.It is made of polyester and is very thick. It also gets good scores for being able to dry quickly. From what I gather, this shower curtain is also easy to clean as you simply have to toss it in the washing machine. Many reviewers .com are also amazed that the material is thick and belies its reasonable price. With its gray and blue color scheme, this shower curtain can add flavor to any bathroom. It can also give you the right level of privacy you desire in your shower area. Those who aren’t impressed with this shower curtain, however, point out that the material is thin. They also say it has a tendency to easily get wrinkled. This is basically the same as the item that precedes it. However, it does have a different design.This trellis shower curtain has a fretwork motif and can add sophistication to any bathroom. Like the other InterDesign shower curtain, this one is made from 100% polyester. It is also washing machine-safe. There are 12 reinforced button holes for hanging this shower curtain. It measures 72 inches x 72 inches (width x length). It is also well-rated .com. Many satisfied owners say the design of the curtain is what made them buy one. They say that it can enhance the look of a bathroom. Others say the curtain blend perfectly with the tiles in their bathroom. They also like that the curtain is lightweight. It may not be the thickest curtain, but at least it won’t get stuck when being drawn. This is another shower curtain that is made of polyester. Unlike other polyester curtains in this list, however, it does come with 12 metal roller rings. The rings are rip resistant. It measures 70 inches long and 72 inches wide. Aside from being very resistant to mold and mildew, this shower curtain is getting goods scores .com for being very sturdy. Most of the testimonials on this shower curtain indicate that it is of superior quality. It is thick enough not to snag easily. Another good thing about this shower curtain is that it comes in a variety of colors. From chocolate to orange to gray, you’ll have a lot of colors to choose from. Thus it is very likely you will be able to choose a shower curtain that matches the theme of your bathroom. InterDesign makes it back to this list with this water repellent shower curtain.Like the other products of InterDesign, this shower curtain is made of 100 percent polyester. It has reinforced seams for the holes. This shower curtain is also available in various colors. There are 14 color choices that you can choose from. If you want a shower curtain that would let plenty of light, you should choose the white color. Cleaning it is easy, too, as you only have to wipe it clean with a damp cloth. Some of them say that it easily gets mildew. They add that this shower curtain would have mildew after a month or so of use. But for its very low price, that minor issue seems very forgivable. Unlike other shower curtains in this list, this one from Epica doesn’t come in various colors. It is a clear shower curtain. Surely, it won’t provide you with some privacy but that’s probably the only disadvantage I can think of about this shower curtain. There are a lot of things I like about this shower curtain. It is made of heavy duty vinyl. It won’t rip easily. Plus, it has reinforced nylon mesh header with metal grommets that are rust-proof. Indeed, durability is one of the good qualities of this shower curtain. Because of its heavy duty construction, this shower curtain can stay in place well. It drapes nicely and stays down due to its material. When it comes to cleaning, this shower curtain should not give you any problems. Simply wipe it clean with warm, soapy water. Finally, the manufacturer backs it up with a 15-month money back guarantee. This is perhaps the most attractive shower curtain in this list. Its autumn-inspired print will leave you and your guests breathless.It is a cheap but effective way of dressing up your dull looking bathroom. This shower curtain is made of polyester. It measures 69 inches long and 70 inches wide. Its vivid design is arguably its main selling point. Despite the very attractive design, there are some flaws in this product. The rings that come with it are cheap, according to those who have it. The material is also rather thin. Plus it is not waterproof, so you will need a liner for it. I highly recommend the 10 best shower curtain units I listed above. These are top rated shower curtains .com, with many online reviews speaking highly for these products. 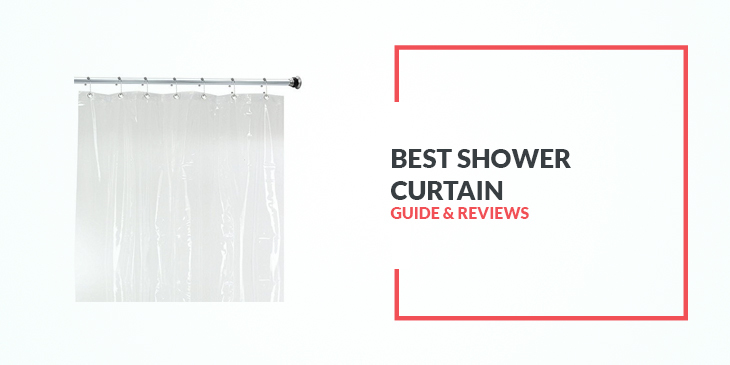 Most of those who reviewed these shower curtains say they have been able to spruce up their bathrooms and more importantly, prevent water from getting their bathroom floor soaking wet. It can be tough to choose just one shower curtain, but you can always go back to the factors to consider in shopping for a shower curtain. This way, you will be able to trim down our list and select the right curtain for your bathroom.